They say that imitation is the highest form of flattery. This fascinating and instructive book was designed as a sequel or supplement to the splendid collection of grammatical items first published in Ruge Rules. Ferdinand E. Ruge was for many years a teacher of English at St. Albans School, in Washington, DC. Daniel Hoyt Daniels was a student in Mr. Ruge's classes throughout his sophomore, junior and senior years, and was "profoundly affected" by Mr. Ruge and his uncompromising insistence upon rhetorical excellence. The present volume follows the pattern and style of Ruge Rules, bringing in additional points Ruge might well have espoused as well as observations of evolutionary trends, new expressions, and questionable usages that have recently crept into the language, some of which might have made Mr. Ruge shudder. 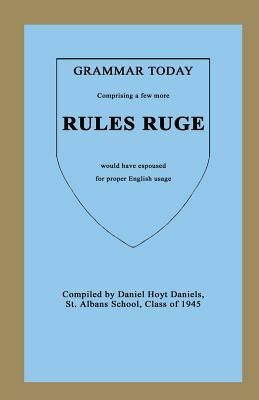 Like Ruge Rules, this book hopes to bring attention to details of good grammar and help encourage the reader to maintain the goal of "clear, correct and reasonably graceful English," as Ruge used to say.